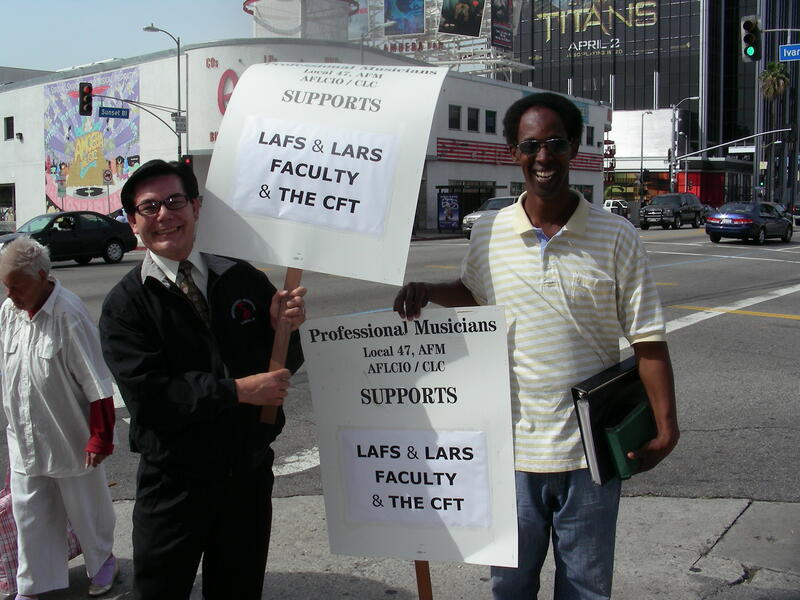 From working together in unity with fellow labor unions, to rallying in solidarity with our sisters and brothers on picket lines and protests, AFM Local 47 has a long and rich history among and within the labor movement. 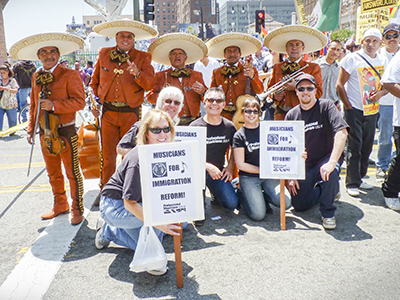 To commemorate Labor History Month, we reflect on these ties by taking a journey back more than 70 years to the 1940s, when the Los Angeles musicians union was involved in a flurry of labor activity. In the early 1940s, Local 47 established a Committee for Union Defense to offset a vicious anti-labor campaign in the state legislature at the time. 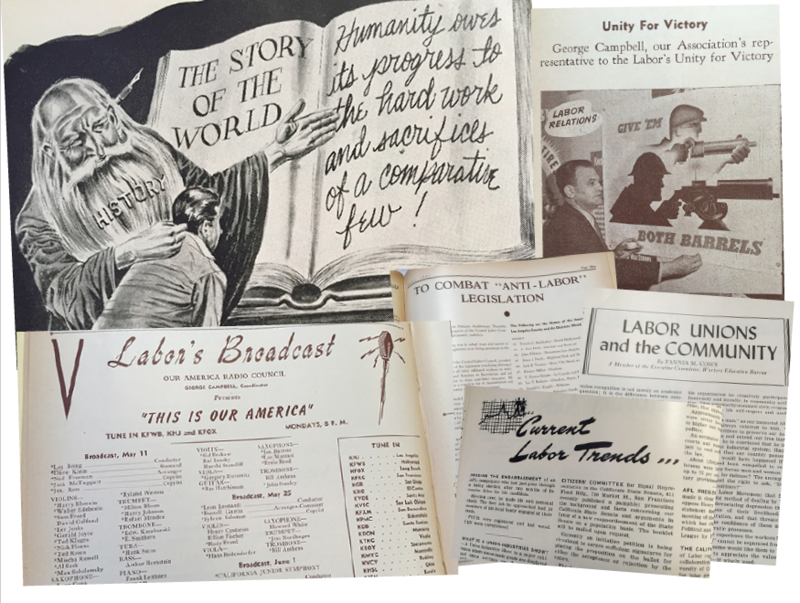 The committee launched a weekly national labor radio program, “This is Our America,” with Our America Radio Council, in 1941. 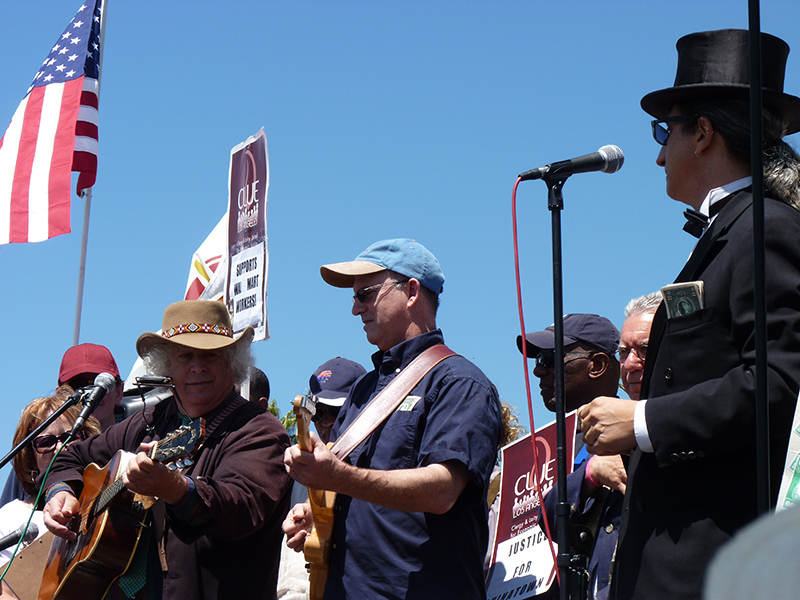 The broadcasts featured live union musicians performing over the airwaves. In its first year, over 800 musicians performed on the program under an eclectic array of bandleaders, including Scott Bradley, Don Briggs, Bob Crosby, Alfred Egizi, Skinnay Ennis, Dave Forster, Emil Gerstenberger, Gordon Jenkins, Glenn Miller, Ozzie Nelson, Alfred Newman, Fats Waller, and Meredith Willson. 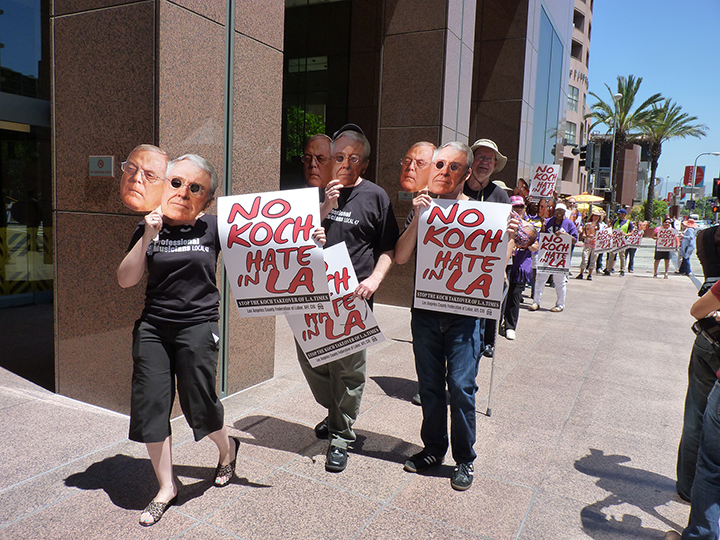 “The most vital work of these District Committees is the contact with the general public and the stimulus to more friendly feeling among people for their own champion of human rights of ORGANIZED LABOR. The history of the American Labor Movement is a glorious one of struggle for better living conditions for all Americans and this fact is cleverly glossed over or left out by the agencies of public information, radio, newspapers, and periodicals. Therefore, we must develop our side of the picture by radio, press and field contact (District Committee). 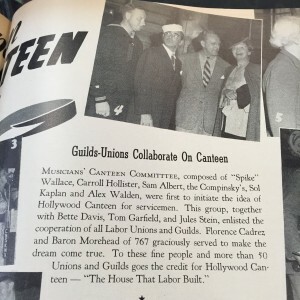 On the lighter side of union solidarity, in the autumn of 1942 the Local 47 “Musicians’ Canteen Committee” initiated the idea of establishing a canteen in Hollywood expressly for servicemen. Enlisting the support of celebrity actors Bette Davis and Tom Garfield, along with the president of Music Corporation of America Jules Stein, the group gathered donations from more than 50 labor unions and guilds in the surrounding area, including AFM Local 767 (the all-black Los Angeles musicians union prior to the 1953 merger with Local 47 as a single union). 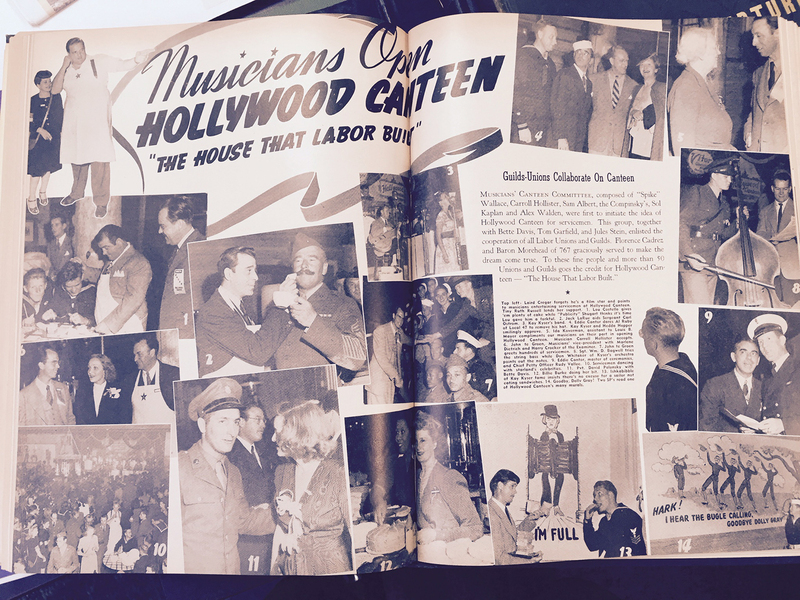 Touted as “The House That Labor Built,” the Hollywood Canteen operated on Cahuenga Boulevard between October 1942 and November 1945 as a club offering food, dancing, and musical entertainment for servicemen. Even though the majority of visitors were U.S servicemen, the canteen was open to servicemen of allied countries as well as women in all branches of service. A serviceman’s ticket for admission was his uniform, and everything at the canteen was free of charge. Stars volunteered to wait on tables, cook in the kitchen and clean up. One of the highlights for a serviceman was to dance with one of the many female celebrities volunteering at the Canteen. The other highlight was the entertainment provided by some of Hollywood’s most popular stars, ranging from radio stars to big bands to novelty acts. On Sept. 15, 1943, the one millionth guest walked through the door of the Hollywood Canteen. The lucky soldier, Sgt. Carl Bell, received a kiss from Betty Grable and was escorted in by another beautiful star, including Marlene Dietrich. By 1944, the Canteen had become so popular that Warner Bros. made a movie titled “Hollywood Canteen.” Starring Joan Leslie and Robert Hutton, the film had scores of stars playing themselves. It was directed by Delmer Daves, who also wrote the screenplay. At the time the Canteen closed its doors, it had been host to almost three million servicemen. Today, the site of the Original Hollywood Canteen is occupied by a parking garage for the office building at 6430 Sunset Blvd. 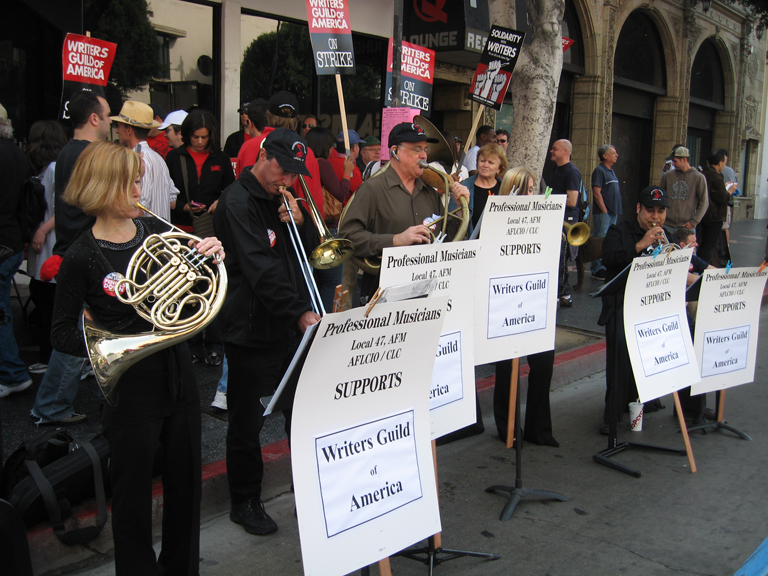 Jumping forward to today, the Los Angeles musicians union still holds a prominent place in the city’s labor arena. 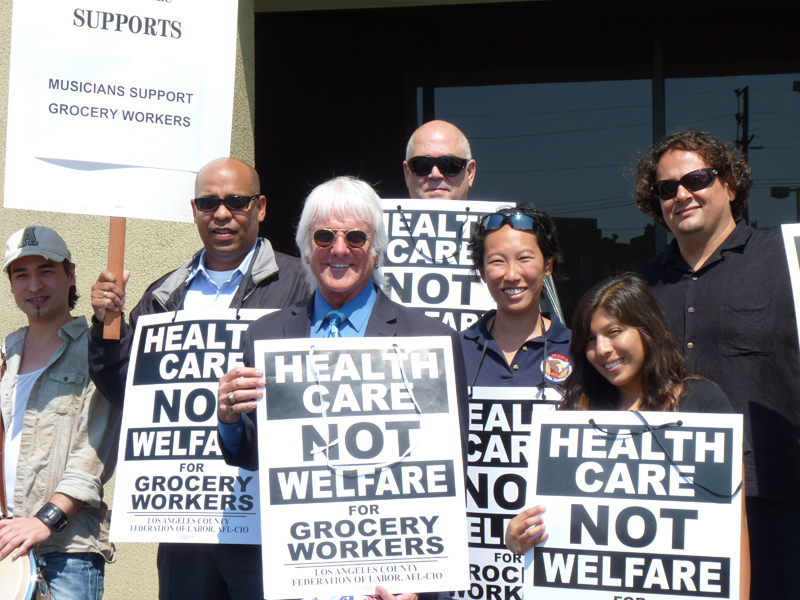 Our ties with the Los Angeles County Federation of Labor continue, with Local 47 having six delegates as representatives to the city’s main labor body. 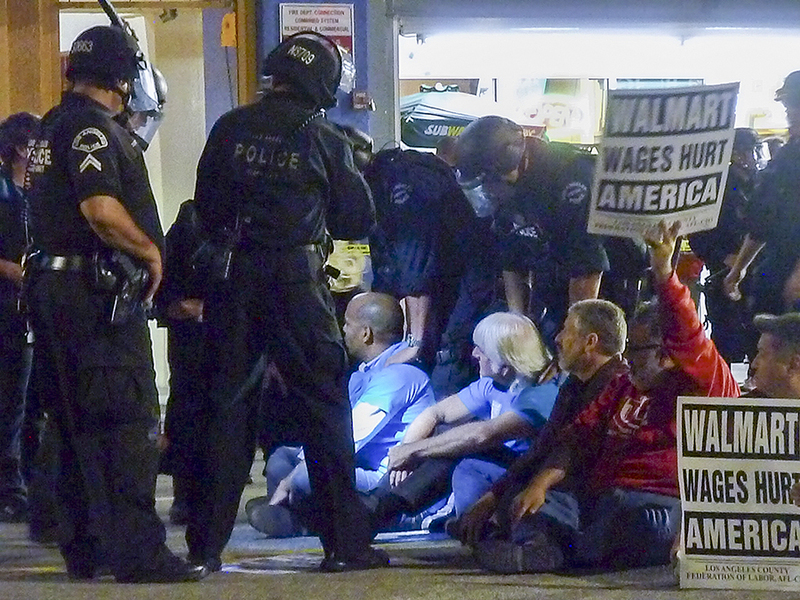 From rallies against anti-union mega-corporation Walmart to the current fight for a $15 minimum wage in Los Angeles County, our Local and membership continue to foster a strong connection with the labor community. – This article was originally published in the May 2015 Overture Online.